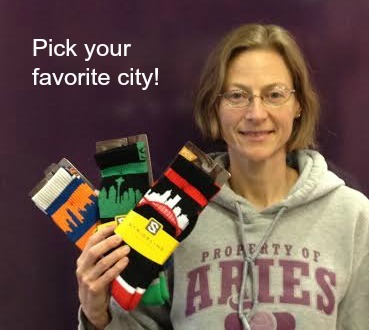 Aries’ Staff Holiday Gift Favorites! She loves these capris because they are so versatile! She can wear them under shorts to work out, or under a long skirt when it’s too cold. They are comfortable and easy to move in. Fav tights! Marianne’s Pick: Nike Ear Warmer Headband $18 Marianne loves these headbands for those cold runs during Cross Country season, or all year long! They keep her warm but also breathe well so she doesn’t overheat. Plus they’re reversible and come in fun color combinations. Stephanie’s Pick: Hydroflask Water Bottle $24-40 “I am in love with my new Hydroflask. Not only does it keep liquids cold up to 24 hours or hot for 12 hours, but it doesn’t produce condensation, meaning my hands and fabrics stay dry. Brittany’s Pick: Sport Sweats $30 “I love the Boxercraft sports sweats because they are super comfy! They are great for representing your sport in a great, fun, colorful way at tournaments, school or home. If you’re inside or outside, they will keep you warm! Makenzi’s Pick: Volleyball Pal $24 “I really like the Tandem Volleyball Pal because it is a quick and easy way to get some practice in. It comes in handy for those days where I don’t have anyone to practice with. It helps me improve my technique, form and game. The adjustable cord is good for different types of training. The fact that it is lightweight and flexible makes it very easy for me to transport it anywhere I’d like. Overall it’s a great way to focus on distinct training and very convenient for any time or place!